My friends, Stacey and Ruth, run a blog that you just have to follow, particularly if you are a writing teacher. Their work at Two Writing Teachers is inspirational (and they are working on a book right now, so that’s even better) and you are sure to come away with great ideas for the classroom. Two years ago, and then again last year, I joined them for a month-long project called Slice of Life Challenge, in which they ask followers of their blog and others to write a bit about a moment in their day, post to a blog and then link off Two Writing Teachers (although I suppose you probably could also write in their comment slot for that day, too, if you are blog-less … but don’t be blog-less! Create one for this project, if you need). 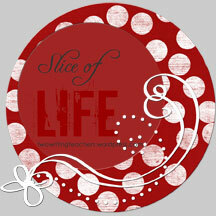 My Slices are still archived here on my blog, which is pretty neat (see for yourself). They call it a challenge because they are hoping that participants will write a Slice of Life post every day in the month of March. And here it is, almost March already. There are gifts for folks who complete a post every day and kudos to those who try to do every day but don’t quite succeed. And even if you pop around to read the other Slices, and add a comment here and there, the value is that your online writing community expands pretty significantly during Slice of Life. Plus, Stacey and Ruth are cool. So, there’s that. You can read more information here by Stacey and Ruth about the Slice of Life idea. Thanks for your kind words about us and the SOLSC! We appreciate all of your support Kevin.